A few months ago, one of my teenage piano students asked for this classic song when she heard her friend playing it. 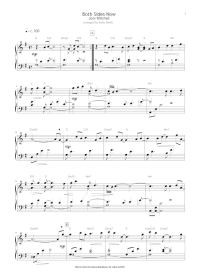 It's been included in the 2011-2012 ABRSM piano exam syllabus (grade 3) in the UK. Since the ABRSM's version is very short, I decided to arrange a full version with some additional harmonic flavours of my own. As I studied this song in depth, I was completely enchanted by the hidden charm this particular melody has. I simply wanted to explore where it took me. Here's what came out. I hope you enjoy playing it as much as I enjoyed arranging it. I'd like to thank a few people here. First,Les Irvin, who took an interest in my arrangement and kindly suggested that it be published here. Second, Dave Blackburn, who helped me with the chord chart. Last but not least, Joni Mitchell, for giving us such a memorable song.